So you got a Hornby train set for Christmas or perhaps taken the plunge and bought your first model railway, probably a Hornby starter set. You’ve unwrapped and carefully opened the box. All DC model train starter kits will have the same basic bits. There’ll be the track; some rolling stock (the vehicles that run on the rails), and the electrical bits that provide power and control of the trains. 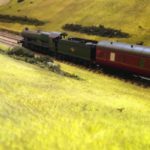 In some starter packs – Hornby in particular – there might also be a track matt. Don’t worry if you don’t have this, it’s just a guide to help place the track. If you can resist the urge to dive in and start playing, take a look at each part and familiarise yourself with it. It’s not vital, and admittedly few people actually do this, but I find it helps. 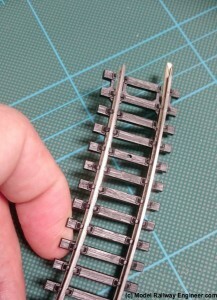 The first thing to do is connect the track together. 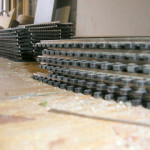 Take a close look at a section of track. You’ll see that there are two rails. At either end of the track, one of these rails will have a tiny clip sticking out. Look at another piece of track and you’ll see the same. Connecting track together is simply a matter a matter of pushing the track together so the clip on one rail slides under the protruding bit of rail on the next section. Run your finger over each join, there should be no ridge or gap between sections of rail. If there are the trains will most likely derail. Where you feel a gap or ridge, gently pull the track apart and slide them back together. Assemble all the track until you have the oval layout shown on the box. One of the track sections will have a power clip attached. If not, locate this — pictured — and slide it between the back bars (sleepers) on part of the track. You’ll want this facing outwards and near a wall plug. Next, find the controller (the box with the dial on it). Coming from this will be a lead with a two pin plug. Connect the plug to the track clip by pushing the pins into the holes on the outside edge of the track clip. Finally, plug the power cord into the controller and the other end to a wall socket and you’re done. This quick video should make things clear if any of this doesn’t make sense. That’s it. Your railway is set up and ready to go. Carefully, place the locomotive on the track, turn on the power and slowly turn the dial on the controller. Your tiny train should burst into life and set off forward or backward. The direction of the train is set by the switch on the controller. Turn the dial on the controller until the power is off and the train stops; flick the switch and slowly adjust the dial to increase the power again. The train will now move in the opposite direction. 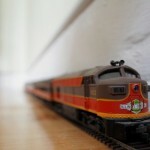 Take the train for a few laps, varying the speed and have some fun and then connect some of the other rolling stock. 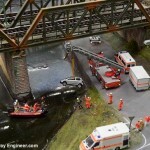 The possibilities with model trains are endless. When you’re ready you can add more rolling stock; stations and buildings; tunnels and scenery; track to make the oval bigger or even join other ovals and branch lines to take trains off in different directions. It’s completely up to you but for most people, expanding the track is the first thing they do. Adding more track provides a bigger circuit on which to operate the trains and provide more variation. 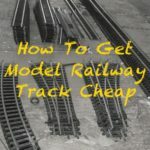 The most common track expansion options are covered in my next post — how to expand model railway track. 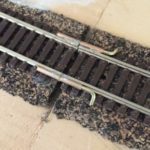 If you have any problems getting your railway working, read my troubleshooting guide and check these maintenance tips, especially if the railway is set up on the floor or table top. 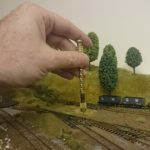 Update: For the sake of clarity, the picture of track at the start of this article is N gauge track rather than OO and is for illustrative purposes only. The information in the article remains the same and applies to both N or OO track. Thanks to Jamie Flint for picking me up on this. WE ARE JUST STARTING OUT IN BUILDING OUR FIRST RAILWAY. THE SIZE OF THE BOARD IS 8FT X 7FT. WE DONT WANT LINES EVERWHERE. BUT WHAT WE DO WANT IS SMALL TOWNSHIPS, FARM LAND, STATIONS. ENGINE SHED. A MOUNTAIN WITH A MOUNTAIN RAILWAY. THE MAIN LINES GOING UNDER THE MOUNTAIN. Hi, I have a few Locomotives and train tracks and will get more, but i need help with the landscaping.